We have been trying out some new flavors lately, and they are really an excitement to the palate. Greek food is a Mediterranean cuisine. Contemporary Greek cooking uses a lot olive oil, including lemon juice, vegetables, herbs, grains, bread, wine, fish, lamb, poultry, rabbit and pork. We have to say the use of rabbit in their cuisine was new for us. It is very important to never forget olives, cheese, eggplant, zucchini, and yogurt. Greek desserts also are known for their use of nuts and honey. Some of the desserts are Baklava, Greek Rice Pudding, and a Quick and Easy Greek Yogurt Dessert, that consists of only 4 ingredients, strained Greek yogurt, sweetened condensed milk, lemon zest and juice, biscuits Petit beurre. Wow that all sounds so delicious, doesn’t it? All of those wonderful desserts including main dish meals found their way into Greek cooking, as Greece has a culinary tradition of some 4,000 years. Yes, 4,000 years to perfect their flavorful culinary meals and treats (dessert). Ancient Greek cuisine rarely included meat (lamb, poultry, pork, and rabbit) in their food preparations as it was not readily available. But fish was always available, as well as today, their more common source of animal protein. Their favorite beverages are Portokalada (orangeade) and Lemonada (lemonade). These beverages have been popular in Greece since 1971. These refreshing beverages are served everywhere, in Greek homes, cafes, taverns, and restaurants. They are made with fresh strained orange juice or lemon juice, and mixed with the choice of carbonated water or flat mineral water, and sugar is added to taste. What do you know about the Greek history of food? Let’s know by leaving your response in the comment section below this article, thanks. 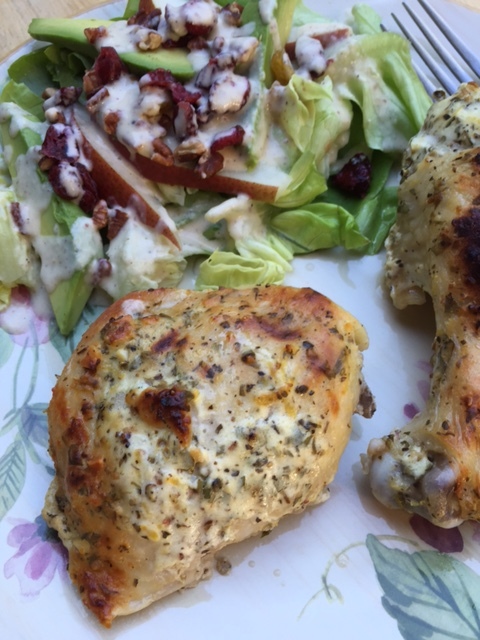 Now for our featured recipe: Greek Marinated Chicken with Butter Leaf Lettuce Salad. First let’s prepare the marinade for the chicken, then set it aside to prepare the salad dressing. Here is what you will need. 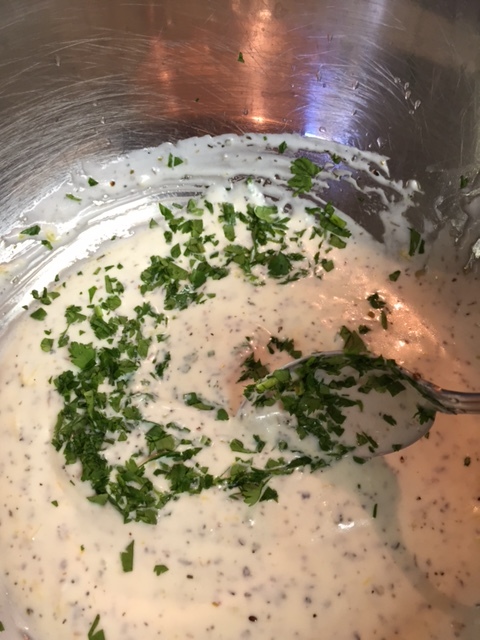 For the marinade, mix together in a large bowl the yogurt, olive oil, minced garlic, oregano, salt, and freshly crushed pepper corns. 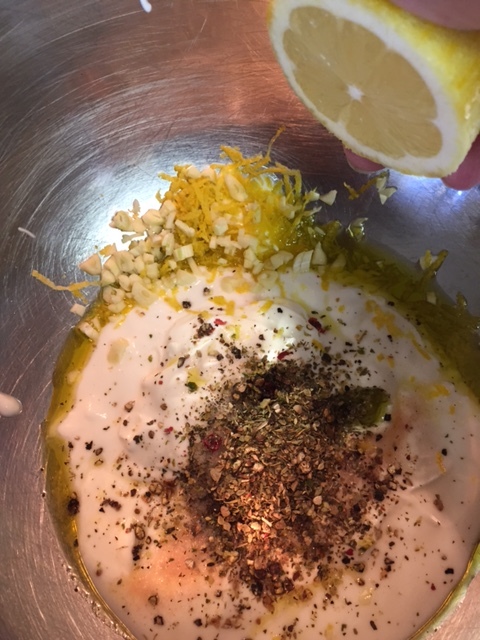 After mixng ingredients thoroughly, add lemon zest and lemon juice, and mix in. Chop a big handful of cilantro, or about ¼ bunch, and stir it into the marinade. You can use parsley, if cilantro doesn’t agree with your palate. We could not find any history of the use of cilantro in Greek food, though cilantro is cultivated in Southern Europe where Greece is found. Add the chicken pieces and marinade to a large glass bowl, making sure all chicken parts are covered with marinade. Cover the bowl with plastic wrap or albumin foil, and place in refrigerator for a least 30 minutes. 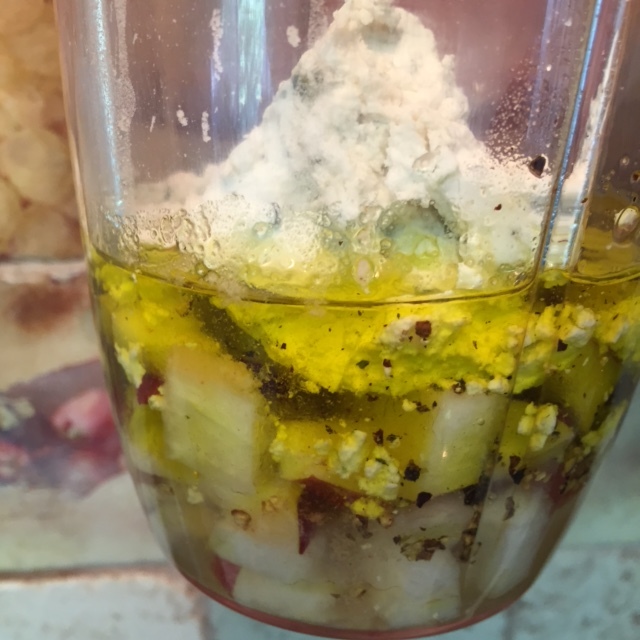 While the chicken is marinading, let’s make the Herbed Goat Cheese and Pear Dressing for the salad. Here is what you will need. Blend together in a blender, or food processor (we used our Nutri-Bullet) the oil, pear nectar, balsamic vinegar, lemon juice, mustard, diced pear, cheese, salt and pepper until smooth. 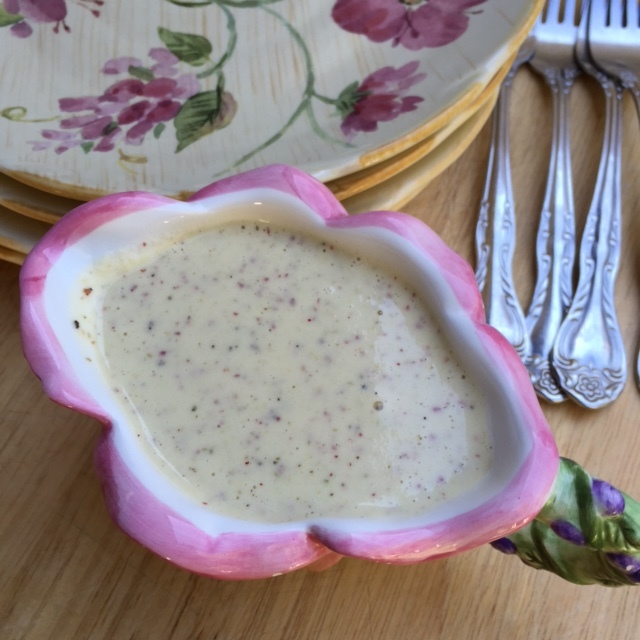 Pour into your favorite dressing server, or a jar and set aside in the refrigerator. Next preheat your oven to 375 degrees. 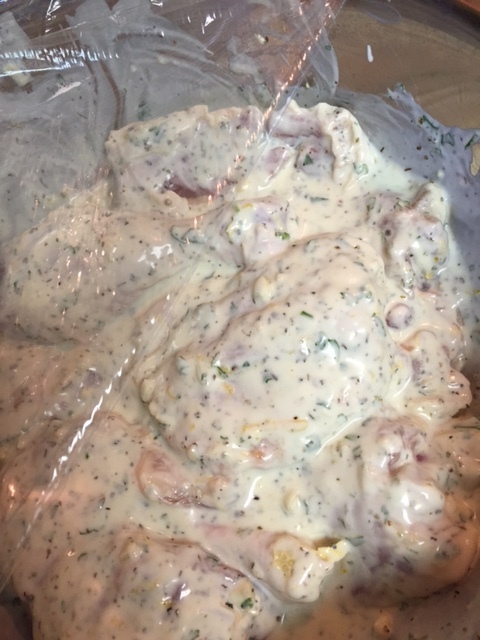 If it has been 30 minutes, remove chicken from glass bowl and place into a 9 X 13 glass baking dish. 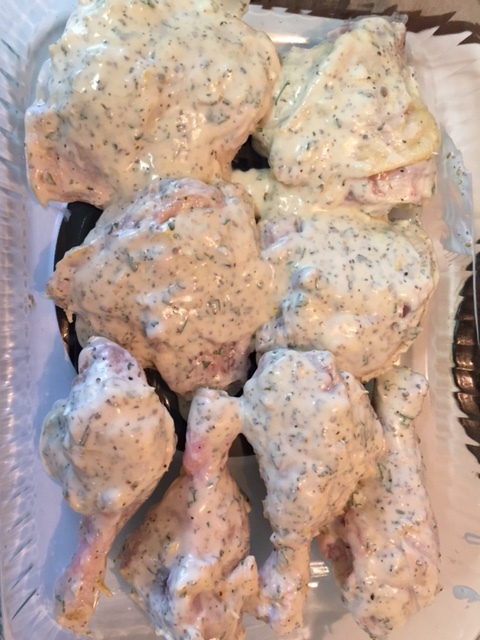 Bake chicken for 45 to 60 minutes or until chicken is cooked (about 165 degrees internal temperature) and golden brown on top. Set aside to cool about 5 minutes, meantime prepare the Butter Leaf Lettuce Salad. 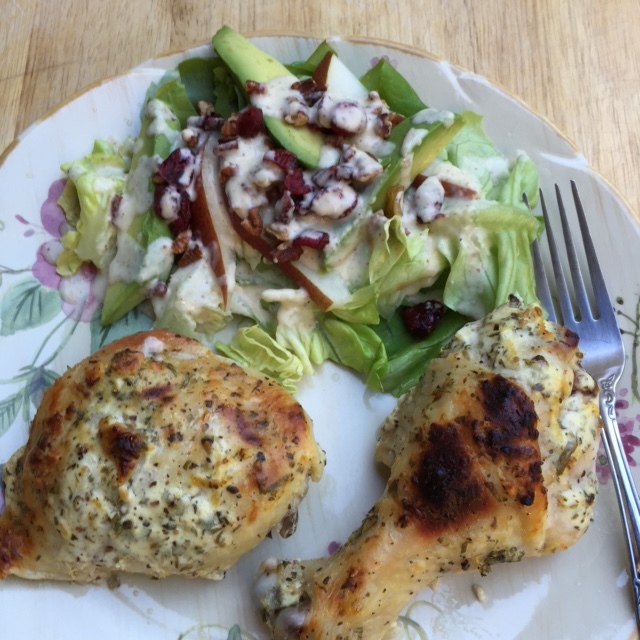 Place the Butter leaf lettuce wedges on 4 salad plates or one side of a dinner plate. 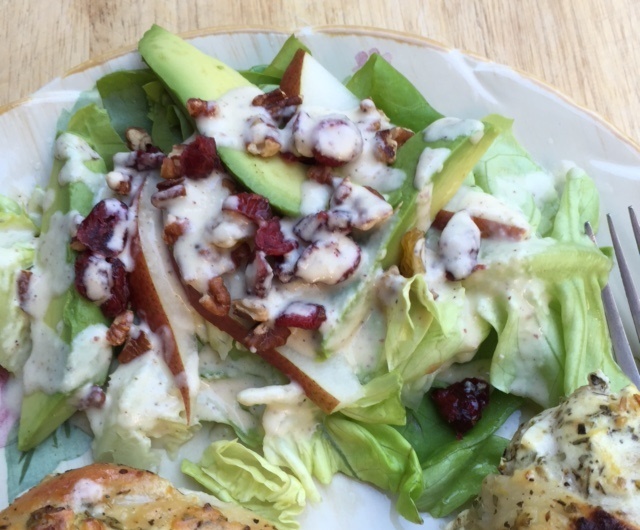 Arrange the avocado slices, pear slices, pecan pieces, and dried fruit over the lettuce. Drizzle with the dressing. Next add to each plate two pieces of cooked Greek Marinated Chicken and serve. This entry was posted in Chicken, Main Dish, Soups and Salads and tagged 12-hour clock, Acorn squash, Alexander the Great, Apple pie, Avocado, Bartlett red pears, cilantro, dried fruit, Fast casual restaurant, Goat cheese, Greek cuisine, Greek food, Greek history, herbed goat cheese, lamb, Marinated Chicken, Mediterranean cuisine, Mediterranean Sea, Olive oil, olives, pear dressing, Pork, red pears, Strained yogurt, white balsamic vinegar. Bookmark the permalink. Yum – & love cilantro & avocado too!